The strike was a political one, and it was called to protest against the Bossi-Fini migration law, EU policies and Matteo Renzi’s government’s most contested measures: the Labour reform known as Jobs Act, the Constitutional Reform, the ‘Good School’ reform of primary and secondary school, and the 2016 Budget Law. The main aim was to block the centers of the biggest Italian cities and to disrupt the normal operations of the logistics sector, still in uproar after the shocking death of worker and trade unionist Abdelssalam Eldanf, killed the night between September 14 and 15 during a strike in Piacenza. In whichever square or street logistics workers have assembled, this has been the main subject. None of the three main Italian trade unions (CGIL-CISL-UIL) joined the strike in any way, confirming the growing distance between them and the more combative base trade unions in how they struggle for workers’ rights as well as a different attitude towards the upcoming referendum (CGIL has shyly taken the ‘No’ side while CISL has sided with ‘Yes’ and UIL is still undecided). As usually happens when the Italian base trade unions call a strike, around 60% of logistics and transport workers came out, with peaks in the urban transport services of Rome, Bologna and Naples. The airports of Rome, Pisa, Bologna, Milan and Naples were affected. The participation of the logistics workers stopped operations in Padua, Rome, Piacenza, Milan, Turin and Verona. In Rome the strike was joined by those who are protesting against the newborn Movimento 5 Stelle local government, which is clamping down on housing and social occupations. The demonstration ended up in an ‘acampada’ (tented occupation) in San Giovanni Square, renamed for this occasion ‘Abdelssalam Square, after the worker and trade unionist who was killed very recently. 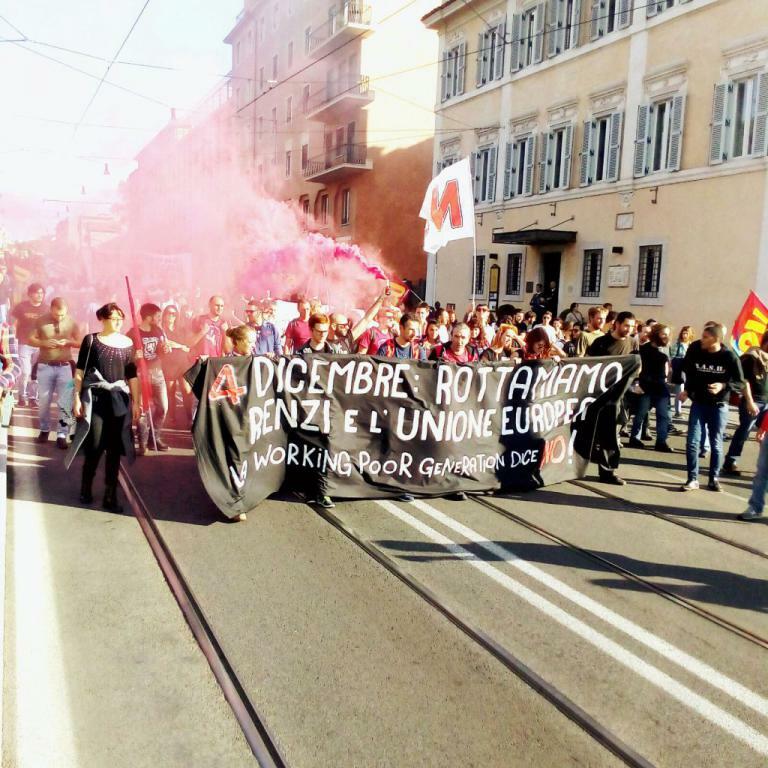 In Pontedera, near Pisa, the workers of the Piaggio plant blocked the railroad, while students in Palermo also marched through the city. City marches were also held in Florence and Rome. The strike and the marches were not covered by national radio, national television or the main newspapers, with the exception of Il Manifesto and a few others. Usb, Unicobas and Usi complained to both Agcom, the regulator and competition authority for the communication industries, and Rai national television about the ‘cloak of silence’ hiding information about the strike from the public. The general strike was extended on Saturday 22nd: in Rome, for the national “No Renzi Day” demonstration, a total of 40,000 workers marched through the city. The demonstration was the first organised by the ‘Social No National Committee’, a group of parties and movements that link the proposed constitutional reform to the neoliberal policies of Matteo Renzi’s government. Among the movements and political parties that joined the demonstration and the National Committee were the No-TAV Movement, the Communist Refoundation Party, the Social Center Cortocircuito, as well politicians and artists, such as Moni Ovadia, Naples’ mayor Luigi de Magistris, writer Valerio Evangelisti and former partisan Lidia Menapace. The ‘Social No’ is particularly endorsed by Giorgio Cremaschi, former President of the CGIL-affiliated Metalworkers Trade Union, FIOM, who left CGIL because of the management of its current Secretary Susanna Camusso. He traces the origin of the reform of the 1948 post-fascism Constitution to the neoliberal policies which have played such a central role in Italy since 1980. Cremaschi believes that the 1948 Constitution of the Republic has its roots in the antifascist Resistance, while Renzi’s reform is based on Italy’s social and cultural regression over the last 30 years. The reform would be the summary, conclusion and settlement of this authoritarian project. It is impossible, according to Cremaschi, to separate the constitutional reform from this government and its political leader Renzi. It is also misleading not to understand the economic and social targets of the reform, the ones asked for by the bank JP Morgan. He claims that voting ‘No’ to the reform would respect the 1948 Constitution, and this ‘No’ must be a social one as well as a political one. The Social No National Committee will hold its next national demonstration on 27 November, and is encouraging a popular and general mobilization against Renzi’s constitutional reform.